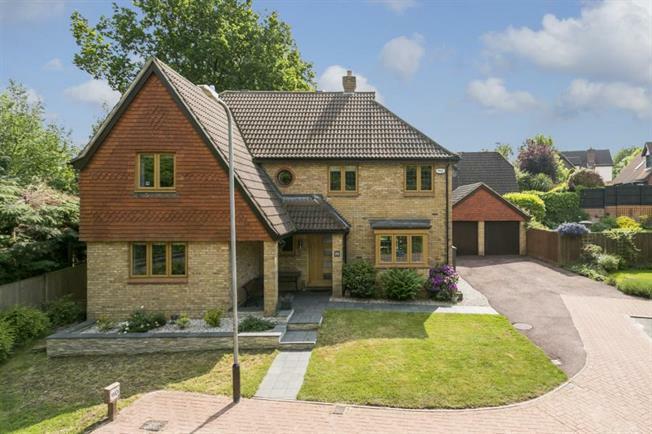 5 Bedroom Detached House For Sale in Tonbridge for Guide Price £1,100,000. An immaculately presented family home renovated to a very high standard, set on a sought-after development within walking distance of Tonbridge town centre. The property has a welcoming feel with accommodation to the ground floor comprising a spacious sitting room with open fireplace, separate dining room, and a magnificent open plan kitchen/breakfast/family room with a range of modern fitted units, integrated appliances and almost side-to-side bi-folding doors to the rear. The kitchen provides ample space for a breakfast island, dining table, sofa area and pool table. There is a further utility room and downstairs cloakroom/wc. Stairs rise to the first floor where there is a generous landing area, master bedroom suite with built-in wardrobes & modern en suite bath & shower room, four further bedrooms and a family shower room. The property is accessed over a private driveway leading to the detached double garage and a separate pathway to the front door. There are two lawned areas to the front with mature raised shrub borders, and a gate providing side access to the rear. The rear garden is a particular feature of the property with bi-folding doors opening up from the kitchen/breakfast room onto a large decked area spanning the width and side of the house. The large summerhouse is to the side of the rear lawn and benefits from light and power, making an ideal home office or games room. Occupying an exceptionally convenient position within this sought after cul de sac in the popular Yardley Park area within very easy reach of all amenities including the main line station with services to London and the South Coast, which is just over a mile and the town centre which is a slightly shorter distance. There is a good range of private and state educational facilities in the area including Hilden Grange and Hilden Oaks, Tonbridge Public School as well as Judd and Hayesbrook at the southern end of the town. Local shops in nearby York Parade and bus services stop close at hand. Access to A21 and thence M25 is about four miles.